Invaders of Mars is a board game for two or more players using Icehouse pieces set in the genre of the B-rated sci-fi thriller movie. Players take turns fleeing from a powerful alien menace bent on using them as fodder for breeding until only one player is left standing. The rules that follow explain the basic two player game with hints and ideas for expansion to include more players. These rules are more of an idea in testing than a real, certifiably fun game. In addition, these instructions were written to be accurate first. Legibility and ease of comprehension is a goal for the second draft. But then again, as the rules are free, I don't suppose you've got much to lose. The Alien pieces should be opaque if possible. If this is not possible, do what you can to make it difficult to identify a nested piece. Players arrange their five pieces in the shape of an 'L' in one of the corners. With two players, opposing corners should be used. This represents the players as the peaceful, if somewhat distant, groups of blissfully ignorant Martians. Next, place one Alien Queen in the center of the board for every two players in the game. The placement of the queen(s) represent the Alien invasion, and should be executed with all due melodrama. Alien Pawns are often called Alien Babies when inside a player's piece or simply Eggs when not in play. If the Alien Queen lands on a player's piece that already has an Alien Pawn inside it, and there are Alien Drones not in play, the player's pieces dies, and is replaced by an Alien Drone. (Again promptly hidden under the Queen which just moved.) The player's piece is placed near his or her corner for all to see, and the Alien Pawn is returned to the stash of pieces not in play. If the Alien Queen lands on an Alien Drone, and there are Alien Queens not in play, the Alien Drone hatches into another Alien Queen! The new Alien Queen is placed underneath (not on top of) the Alien Queen which just moved. The Alien Drone is returned to the stash of pieces not in play. The new Alien Queen is automatically trapped by the one that spawned her and cannot move this turn. If an Alien Queen lands on top of another Alien Queen, nothing happens. Each players turn consists of two parts. The players should take their turns in order of skill, with better players going first. As the game is set in a cheap sci-fi horror flick, the first, somewhat predictable part, consists of fleeing in abject terror. The second part consists of the evil Aliens chasing down the foolishly fleeing, and hence noticable, group of Martians. It is worth mentioning that all of these actions should be done with the setting in mind. Foolishly fleeing Martians are just as liable to make loud, attention grabbing screams as their earthling counterparts. 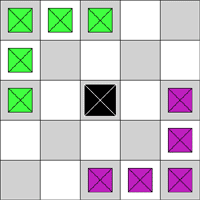 To flee, the player must move one of the pieces of their color. Players may move pieces with Alien Babies inside them. (see Alien Ecology above) Player pieces may move in any one direction, and as many squares as there players in the game. Player pieces may not jump over any other pieces on the board. Alien Queens may move in any single direction, for any number of spaces, and may jump pieces on the board. Alien Queens must move on top of any of the current player's pieces, if possible. Pieces with and without Alien Pawns are considered equally valid options. If none of the current player's pieces are accessible, the Alien Queen must move on top of an Alien Drone, if possible. Each Alien Queen may move only once per turn, and only if there is no other Queen stacked on top of her. If an Alien Queen has more than one valid move, the current player may choose as they see fit. Likewise, the current player may determine in what order the Queens move. The results of each Alien Queens' move are should be handled before moving the next. After the Alien Queens have given chase, play passes to the next player on the left. When all of a player's pieces have been killed (i.e. removed from the board after being replaced by an Alien Drone) that player is out of the game. The last player still in the game wins. Invaders of Mars was concieved and developed by Erskin Meldrew, Liam Bryan, and Marcella Florence. These rules were written down by Erskin. Three player variations are under painful mental development. Any commments or suggestions are heartily encouraged and may be sent to Erskin at erskin@eldritch.org. This file was last modified on December 17 2001 21:45:14.